This is going to be a quick one. First of all, no matter what other meters one might own, the basic illuminance meter, with its readout in Lux or Fc remains an essential. You pull it out, press a button, get a number. The issue is with the latest generation of LED fixtures and retrofit lamps. They present a somewhat skewed spectral balance that can cause issues with older meters. For example, my trusty old (very very old) Minolta Color Meter II shows all LED sources as being roughly 200 CCT cooler than they actually are, sometimes, sometimes not. My other old trusty bag filler is a Minolta T-1H, which is great under daylight and tungsten sources, but not so good under LEDs, where readings are off about 12% most of the time, and when exposed to LEDs with any flicker in them – the meter has a hard time finding a reading to settle on. I also have a Testo 540 digital ligth meter, which is an excellent in-the-pocket device, as it is very slim and includes a cover for the light sensor. 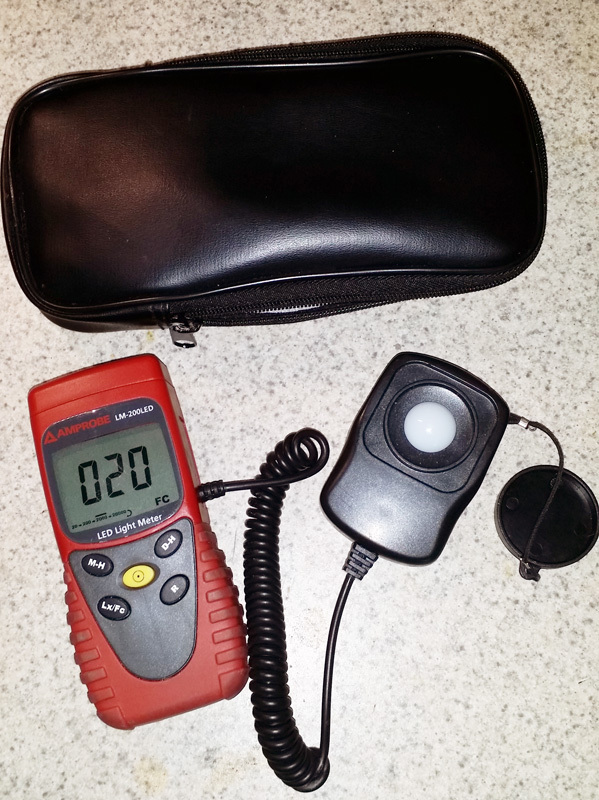 At a cost of under $140, they are hard to beat for a simple tag-along meter for general illuminance measurement. The flicker issue was also experienced in a more contemporary Minotla T-10MA and T-10A although to a lesser degree. Minolta T-10MA – image from Minolta site. I used these in lab conditions for collecting photometric data and in the field. Flickering sources simply confounded getting a steady reading. Under normal LED lights, and all other light sources, these are a great meter, with a ton of options to grid several heads together, remote and mounted head locations, various accessories and add-ons, like AC power, and data downloading, to make these a nice product… however, these neat devices do cost $1,060 for the T-10A, a bit more for the remote head T-10M, plus another $600 for software to connect it and download data via PC. 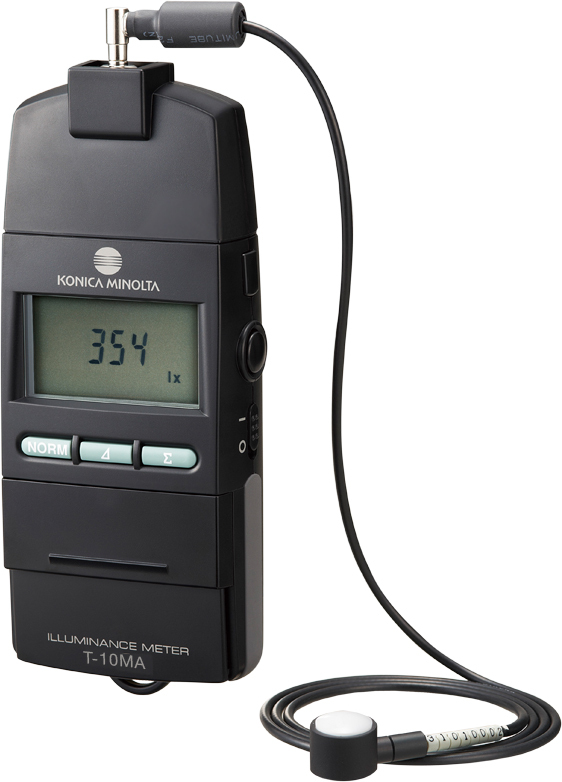 For someone looking for a meter to be calibrated annually, with trustworthy precision, and no need for color analysis, this is about the best package there is, if the budget is available for it. If you need color capability and greater integration of data collection functions, you will likely find the T-10 expensively redundant, as most color meters produce the same readings as part of their output. The T-10, however, does offer features for field studies of illuminance over an area, specifically the grid connection of several sensor heads over a wide area, that few other meters support at this price level. More on the TM series from Konica Minolta This leads to the one meter I use the most when all I am looking for is a quick “how many foot-candles are here” reading. That’s the AmpProbe LM-200LED.